These banana muffins are not only moist and delicious and bursting with flavor (everything a muffin should be), but they are also so easy to make. I made these twice with my 3-year-old and she was able to do most of the work if I helped her measure it all out. 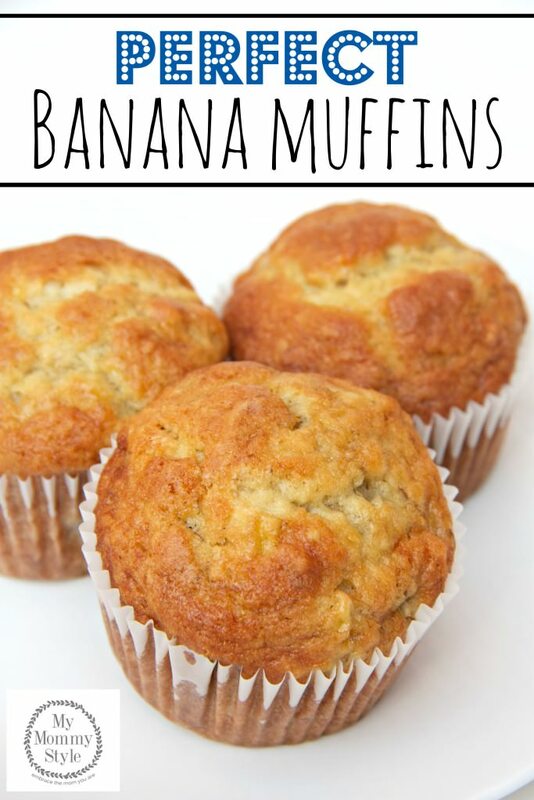 We love these muffins so much that my kids get excited when we have over ripe bananas and they beg for me to make them. They are our favorite! AND they make the house smell amazing! Coat muffin pans with non-stick spray, or use paper liners. Add flour, baking powder, baking soda, and salt in a bowl, whisk to combine; set aside. Combine bananas, sugar, egg, vanilla and melted butter in a large bowl. Fold in flour mixture, and mix until dry ingredients are just combined. Do not over mix (this will make your muffins tough). Scoop about 1/4 cup of batter each muffin tin. Bake in preheated oven for 15-20 minutes. Muffins will spring back when lightly tapped. Linked up at Buns in My Oven, Katherine’s Corner, Saving 4 Six, Tidy Mom and The Pin Junkie. I just made these. I followed the recipe directly, even though I am in Idaho and it usually messes up the recipe. I didn’t tell my husband what they were called, and he just said “Honey, these are the PERFECT banana muffins”. They turned out wonderfully. Golden brown on top, slight spring, moist all through but not wet or doughy. Thank you so much for this recipe. It is actually our 2nd year anniversary today and I wanted to make my Lovely something that he would enjoy. Food has always been the way to his heart. Banana Muffins – Oh, How Wonderful!